“Conquering the Darkness,” an exhibit on the work of the famous artist, Charles Knight, is closing soon at the Museum of the Earth in Ithica, New York. 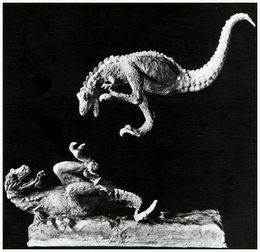 From the 1890s until his death in 1953, Knight filled the public imagination with larger-than-life monsters at a time when paleontologists knew dinosaurs as more than just giant lizards, but not yet as the lively relatives of modern birds. The exhibit has showcased rarely seen sculptures, preliminary paintings and group images since October. These include many from the collection of Knight’s granddaughter, Rhoda Kalt. Supplementing the exhibit are sculptures from the Academy of Natural Sciences in Philadelphia, including dinosaurs and giant mammals. “There’s work from a fairly broad spectrum of his career, ranging probably from the early middle part of his career right up to near his death,” said Robert Ross, the PRI's Head of Education. 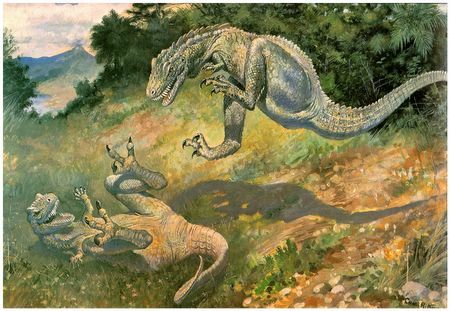 Ross’s favorite, though, is a model (left) on which Knight based his famous Dryptosaurus painting (above). The exhibit runs until Sunday at the Museum of the Earth, 1259 Trumansburg Road. Call the museum for daily hours, 273 -6623.